Alfa Romeo's twin carb Alfasud Ti represented the last (and finest) evolution in the famous line of Alfasuds. It all began in 1972 when Alfa turned its hand to building a type of car completely new to the company - a budget commuter machine. The move was dictated by the Italian Government, a part owner of Alfa. They also insisted that the car be built in the south of Italy (Alfasud literally translated means "Alfa South") and so a former Alfa war time aero engine plant was selected in Pomigliano d'Arco. The fact that the area was one of high unemployment was no co-incidence - the Government hoped to get the area thriving. The 'Sud had little in common with its contemporary Alfa stable-mates, both in the factory location and in the car's mechanical make-up. The water-cooled flat four (horizontally opposed) engine featured overhead valves set in a single row, actuated by a single cam for each bank. This engine layout can be traced to one of the main design engineer's experience with Porsche and VW engines, but it also gave the car a lower centre of gravity. Power was delivered to a four speed manual gearbox but more importantly - and for the first time in Alfa's history - front wheel drive was used. A totally new approach to chassis design had to be undertaken. Suspension specifications were cutting edge for the time, comprising MacPherson struts, coil springs, telescopic shocks and an anti-roll bar at the front. The rear used a beam axle, coil springs, telescopic shocks, two longitudinal Watts linkages (ie 4 links) and a Panhard rod. Major efforts were made in the design of the body to ensure that maximum rigidity with lightness was achieved. Spaciousness was one of the areas where the 'Sud excelled, with its tall cabin and relatively long wheelbase maximising interior space and directional stability. The timeless styling was the work of the famous Giugiaro. The first model rolled off the assembly line with a mass of only 830kg (1826lb), 4 doors and an 1186cc engine producing 47kW (63hp). The result was a car with a top speed of 150km/h (93mph) and handling that was up to Alfa Romeo standards - who said that a commuter car couldn't uphold traditional Alfa values...? It was an instant hit with those who could not afford the company's top line vehicles, and before long, even customers devoted to the larger capacity cars were having to reconsider their ideas. With its precise steering and handling, perfectly chosen ratios and a revy engine, the car was one for enthusiast drivers. Not surprisingly given the company's background, it was only a year before the Alfa released the quicker Ti version. With the compression ratio bumped up from 8.8 to 9.0:1, power rose to 50kW (68hp). A 5-speed gearbox became available and the car lost 20kg (44lb) as it changed to a 2 door design. Top speed was now up to 160km/h (100mph). Alfa found its ability to keep up with customer demand stretched to the limit. Nevertheless, in 1976 the company released the Sprint. This was a sleeker version of the 'Sud and sported a larger engine, displacing 1286cc thanks to a longer stroke. Around 57kW (76hp) was produced, pushing the more aerodynamic body to its max of 166km/h (103mph). This 1286cc (and later a 1350cc) version of the original engine design were used in both the 'Sud and Sprint range for a couple of years - until Alfa got really serious. By now, the company had acknowledged the car's success and was more inclined to mould it into their tradition of sports cars. With an already great platform, the engine was the main item on the agenda for development. Alfa's little flat four grew once again to 1490cc, with an 84mm bore and 67.2mm stroke. However, at the same time as the engine was increasing in capacity, stringent emissions laws were being introduced in various countries. This strangled power outputs - breathing through a single carburettor, the engine made only 63kW (84hp) in Australian models. But even with the emission laws, the quickest Alfasud ever was soon released. 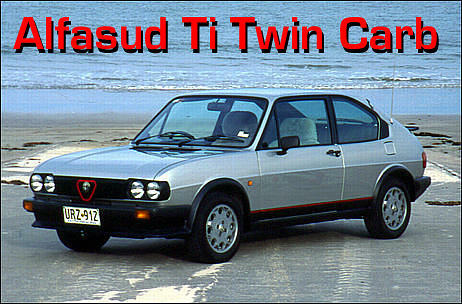 The 1.5 twin carb Ti model of the type pictured in this story was manufactured only in 1983 and 1984 and featured a red-on-black grille, front spoiler and lively red and black interior colour scheme. Its 1490cc engine retained the same fundamental design as previous models but scored a compression ratio of 9.5:1, revised cylinder heads and a completely different induction system using twin dual-throat down-draft Weber carburettors. The use of multiple Webers showed how far the design concept had strayed from that initial government brief. With these changes, the engine made 70kW (95hp) at 5800rpm and 130Nm (94lb/ft)at 4000rpm, while Alfa Romeo's maximum recommended engine speed was 6250rpm. The specific power output extracted from the normally aspirated engine is amazingly high for one from that era - 47kW (63hp) per litre. The engine really came into its element over 3500rpm and despite the twin carb Sud having slightly taller gearing than previous cars, there was still sufficient torque at low revs to haul the light body with ease. The snappy car dashed to 100km/h (62mph) in 11.7 seconds and covered the quarter mile in 17.9 seconds, while top speed was around 180km/h (112mph). As with all 'Suds, rack and pinion steering guided the car at a time when most other manufacturers were still trying to devise methods of minimising slop in recirculating ball systems. The car rode on classic Alfa style 14 inch alloy wheels and wide 185 Pirelli P6s for maximum grip. Combining light weight, good torque, excellent chassis dynamics and stability, the twin carb Ti had motoring journos getting emotional: "The darlings of enthusiasts", "It's a sheer delight" and one tester was even "spurred on with auditory senses tickled by the sporty exhaust note...". Still regarded as one of the most capable FWD packages ever, the car's brilliant steering enabled the driver to place it on a perfect line through a corner with the suspension obediently maintaining that line. Holding neutral through the turn, the car could pull itself out from the apex strongly (so long as engine revs were up) - making it a quick point-to-point car. For a car of such compact dimensions, the Alfa exhibited excellent use of space. In fact, the interior is actually larger in some dimensions than the next-size-up Australian Holden Camira! Four people could be seated in the car, with adequate amounts of head and leg room all round. However, getting into and out of the rear seat posed a problem in the 2-door Ti. Instrumentation was very good, with the exception of the oil pressure and water temperature gauges which were out of sight on the centre console. A tachometer was of course standard. The most common criticisms were of a heavy gear operation and a build quality that wasn't up to some other manufacturers' standards, with little bits and pieces often coming unstuck. Thankfully, the rust problem which plagued earlier models was solved with the twin carb Ti with better quality steel used. The driving position too, remained suited for those with long arms and short legs. Thanks to Steve Muller for access to the car.